And the 2009 champion is…..
After 15 wild and unpredictable rounds of NHRA Pro Stock Motorcycle drag racing, the coveted championship comes down to the tour’s final event, in what has become a two horse race. NHRA veteran Hector Arana will bring a 52 point lead into Pomona over defending series champion, Eddie Krawiec of the Screamin’ Eagle Vance and Hines Harley-Davidson V-Rod team. For most of the early season Krawiec was hands down the class of the field. He won two of the first four races, and by the sixth race of the season in Englishtown, NJ, June 11-14, Krawiec had amassed a comfortable lead in the points – 51 ahead of his closest competition, teammate Andrew Hines. Meanwhile, Arana sat back in the No. 5 spot, despite winning the season-opening Gatornationals. Matt Smith, Doug Horne, and Craig Treble all looked to be more serious title contenders than Arana. As the season played out Arana proved otherwise, quite emphatically. Arana engineered the greatest late-season charge of his career thanks largely to help he received from Pro Stock Car legend Larry Morgan on his engine development. Now after years of struggling with a Suzuki program, Arana’s persistence has led him just a few round wins away from the sport’s ultimate prize. 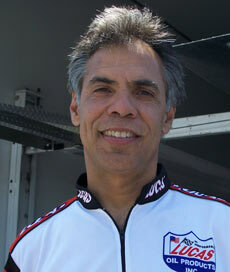 Arana ran a limited NHRA schedule in the early 90s, and in 1996 recorded a career best points finish of fifth. Unable to break through the apparent NHRA glass ceiling, Arana switched from a Suzuki to a Buell in 2007 and found immediate success. He recorded his career best speed and elapsed-time and snagged the sixth top-15 year-end finish of his career. 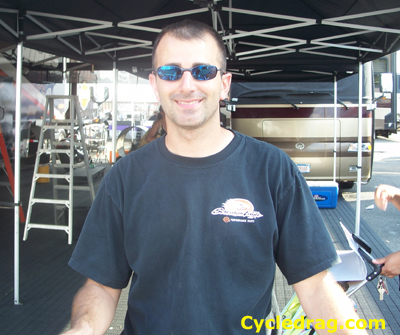 The upward trend continued in 2008 when Arana earned his first career win (Norwalk), had no DNQs for the first time in 11 years, and came within a round-win of qualifying for the NHRA Playoffs. Krawiec’s tale is a much different one. His tenure in the category only goes back to when he would make spot appearances on the tour beginning in 2004, although he’s been surrounded by racing much longer. He served as the track manager for Englishtown Raceway and found great success campaigning a Yamaha in the now defunct AMA/Prostar series beginning in 1999. In all, Krawiec earned nine wins in 23 Prostar finals. During that time period Krawiec’s desire to break into the NHRA Pro Stock Motorcycle class was as strong as Arana’s desire to rise to the next level in the category. In 2004 a backpack-donning Krawiec showed up at the NHRA opener, not as a competitor, but as a racer for hire looking to network with teams and sponsors. In 2007 Krawiec’s dream came to life when he was brought on full-time by the Vance and Hines team to take the place of former team rider GT Tonglet. Krawiec found immediate success on the powerhouse team by qualifying for the Countdown to Four in 2007, and winning the season title in 2008. For Arana and Krawiec it’s been two very different paths that lead to the same goal. So who will be king in 2009? Although Arana controls his own destiny, he’s shown a tendency to red-light or get left on in inopportune circumstances. Krawiec has been more consistent off the line, but will have his work cut out for him making up 52 points in a single event. If Arana can avoid any disastrous reaction times, the Lucas Oil-backed rider should have a clear road to the championship. If you are sentimental you have to be pulling Arana, if you are a dyed-in-the-wool Harley fan, Krawiec is your man. Either way, place your bets.